Okay, so I wasn't able to take a photo of the whole parking lot but they do have a parking space. Lol! 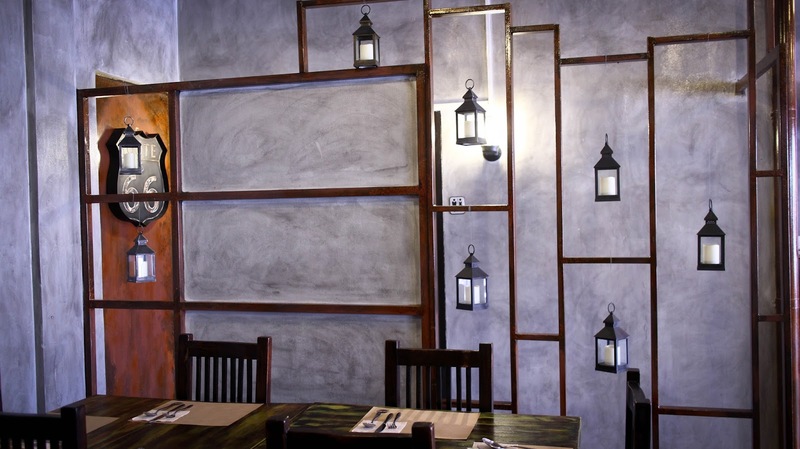 From the exterior, you would already get an idea of their food. 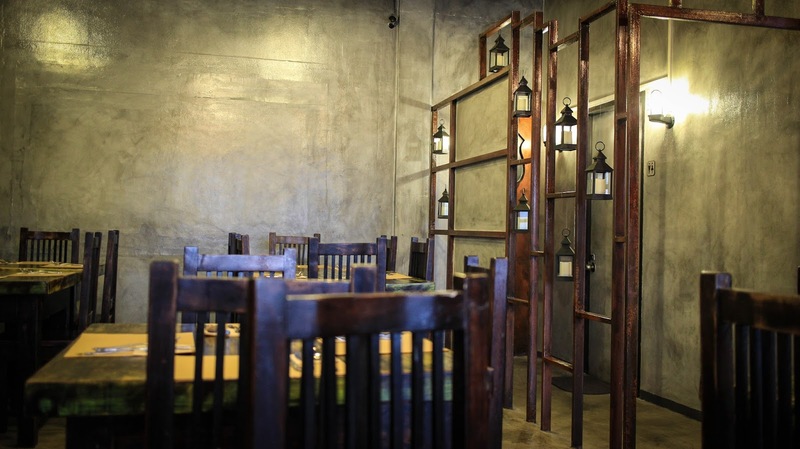 The moment I entered the restaurant, I told my friend that with the interior, it was very obvious that it was owned by a man, which turned out to be true! As much of a girly girl that I am, I also love masculine designs. 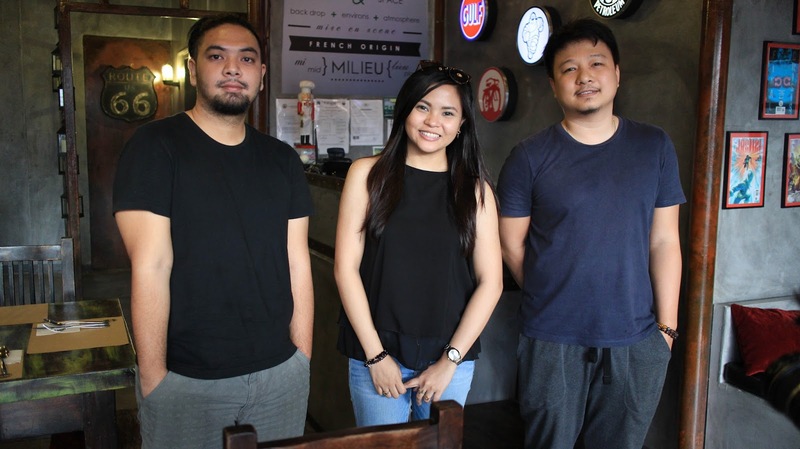 Judging by Milieu's interior, it's also 100% Instagrammable, and everybody will dig it. 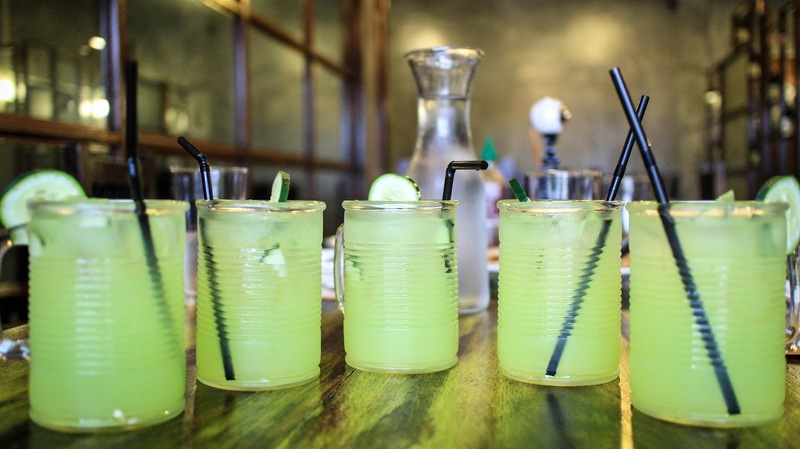 To start off, this drink definitely added up to my favorites list because we all know that cucumber and lemongrass have good benefits. When put together in one drink, its magic will work double time! 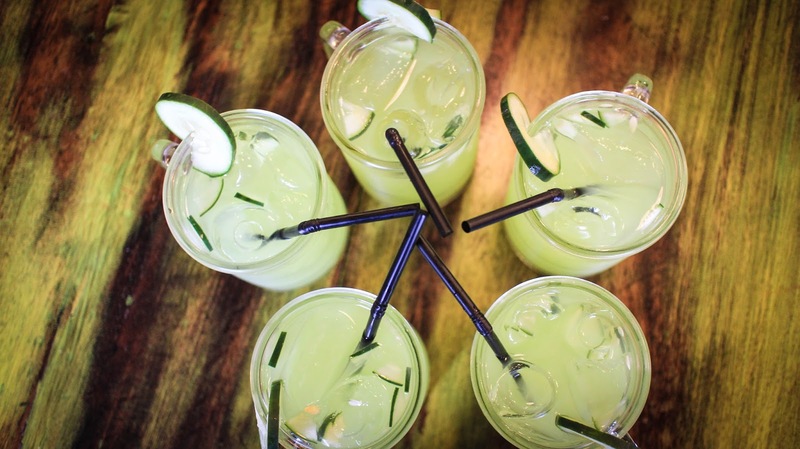 Cucumber Lemongrass Iced Tea helps boost the immune system and clean out the toxins in our body. So when you visit Milieu, include this in your order! It's very refreshing and given all these benefits, you'll fall in love with it all the more. 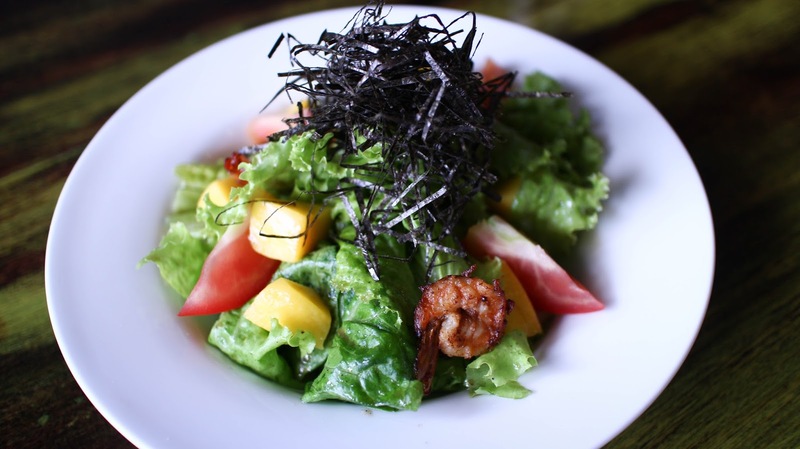 This salad has mixed greens, mangoes, tomatoes, shrimp topped with nori, and has apple wasabi vinaigrette. To be honest, I'm pretty at home with Caesar Salad, but I would eat this salad at any day. My friend, who's also a non-veggie eater (we know, we should eat our veggies), agrees. It is a plate full of healthy stuff that my parents wouldn't have a hard time making me eat! 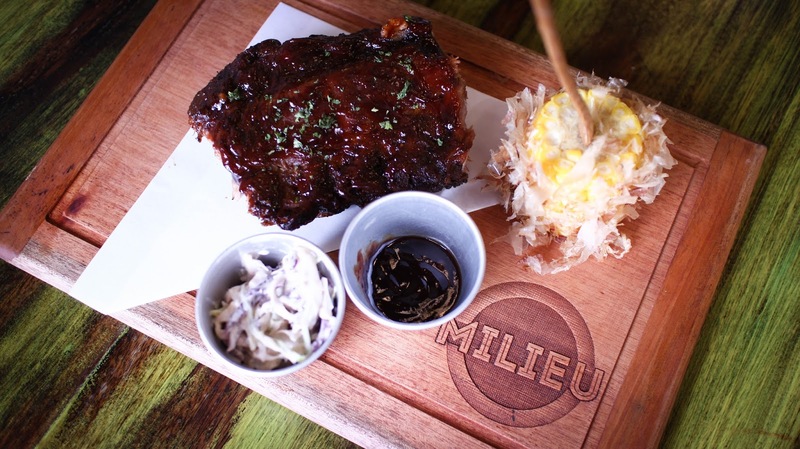 This delight is smothered with homemade barbecue sauce, served with bonito corn & Japanese coleslaw. Lalalala, my my my. Bonito corn - corn cob with bonito flakes. Bonito is smoked dried fish. The taste of the barbecue sauce and the tenderness of the meat is what makes this dish something to be added to your list. 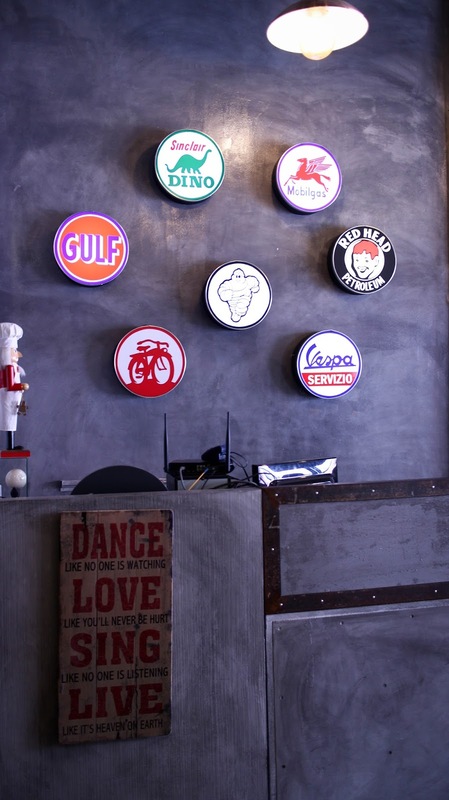 We're very familiar with a lot of rib houses and not so many of these houses would create something very distinct on their sauces - probably because they just get it from somewhere. The careful hands and the brilliant mind that made this sauce deserves more attention! Aaah, my favorite. 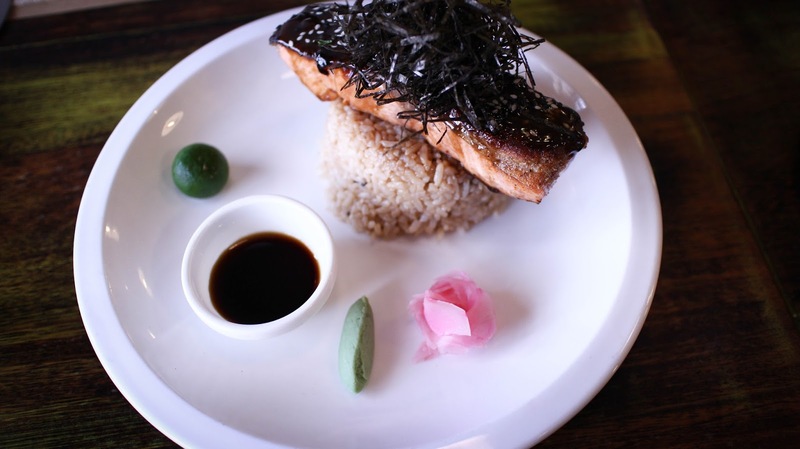 Grilled Teriyaki Salmon served with their specialty rice, shoyu, wasabi, and pickled ginger. What else do I need to say?!!!! Salmon, perfect. Rice, perfect. Everything else, perfect. I loved this dish to the core I think I ate 70% of it (to think there were 5 of us sharing everything lol!) All bola aside, I really loved this dish. The fish was perfectly cooked and the rice wasn't too salty. I tried the sauce but I believe it didn't need to be dipped. 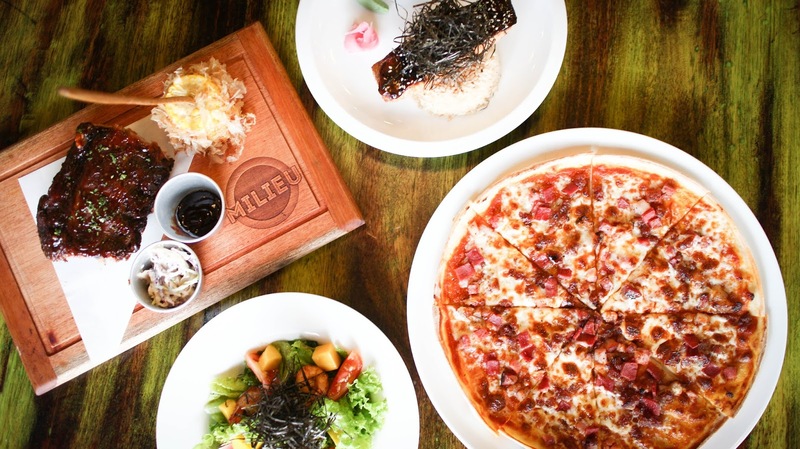 For all the pizza and meat lovers out there, this one's for you! Bacon, longganisa, ham, and mozarella. Oops, wait. There's more! Underneath this meat and cheese excellence, there is tomato pesto! Gaah I remember the feeling of not knowing there was pesto and then it kicked in on my first bite. 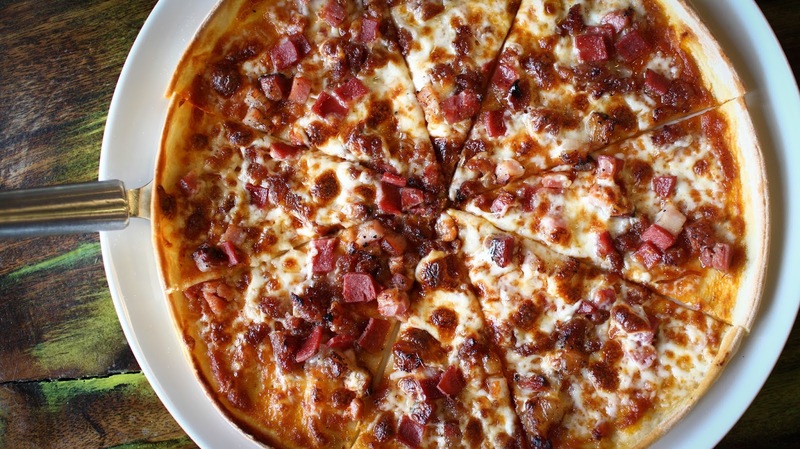 Personally, I am a cheesy pizza kind of person, but this one's too good to ignore. I am also slowly becoming a fan of thin-crust pizzas. 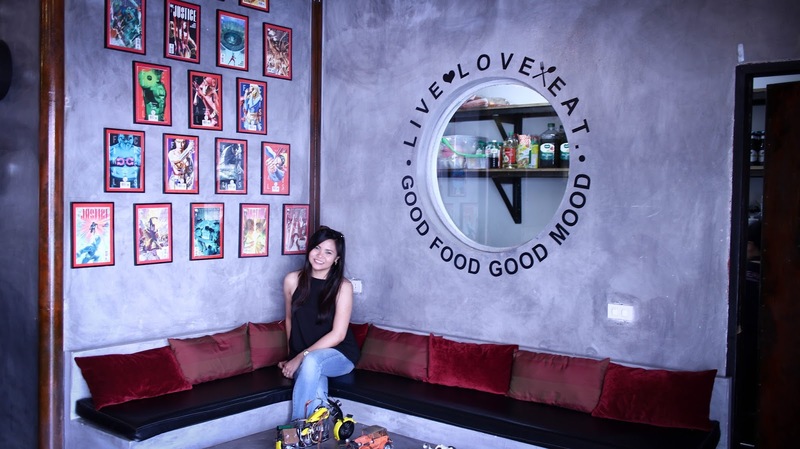 Joining this food trip has really made me change my views on food. 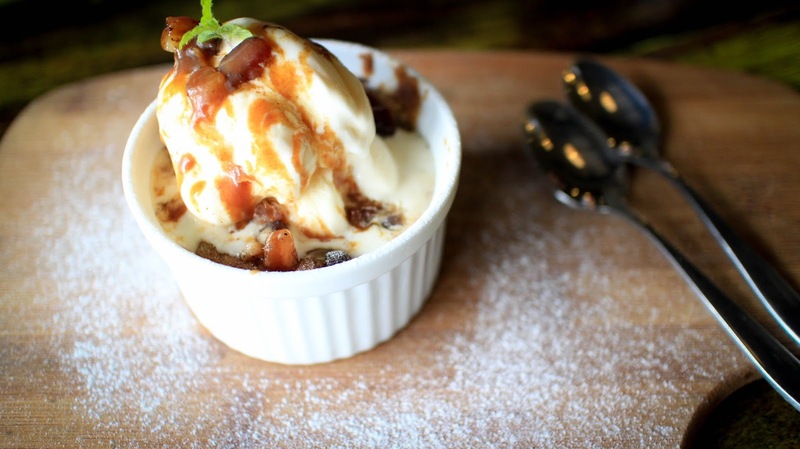 This mouth-watering cookie dough topped with vanilla ice cream, caramel sauce and homemade bacon bits is everything. I underestimated this gift from the heavens at first because I was scared the bacon would be too weird with ice cream and cookie dough but the gods were right - it's heavenly! As of writing, I can still imagine how the dough magically gives my tongue a different sensation as I was chewing it. I'm losing words just thinking of the joy I felt while eating it. My friends and I are not overreacting; it's really that good! 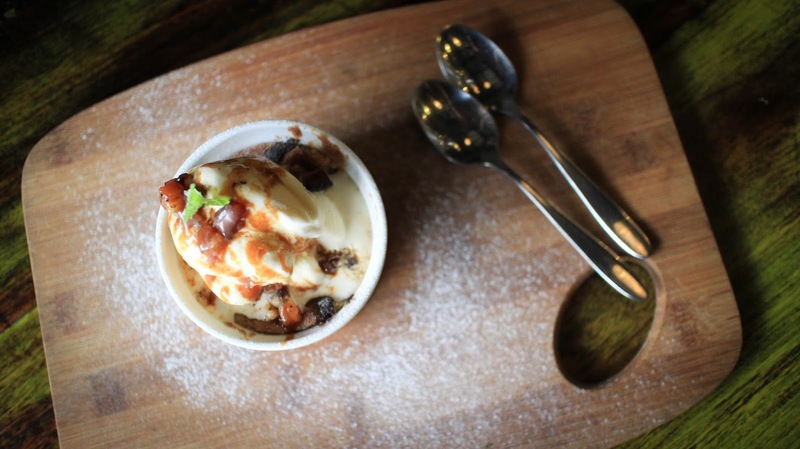 In fact, it's one of the best desserts and for its price, the only guilt you'll have is the one you're putting in your tummy! Must visit the gym as soon as possible. Lol! I'm not exaggerating everything. I mean every single word. I loved every single dish. 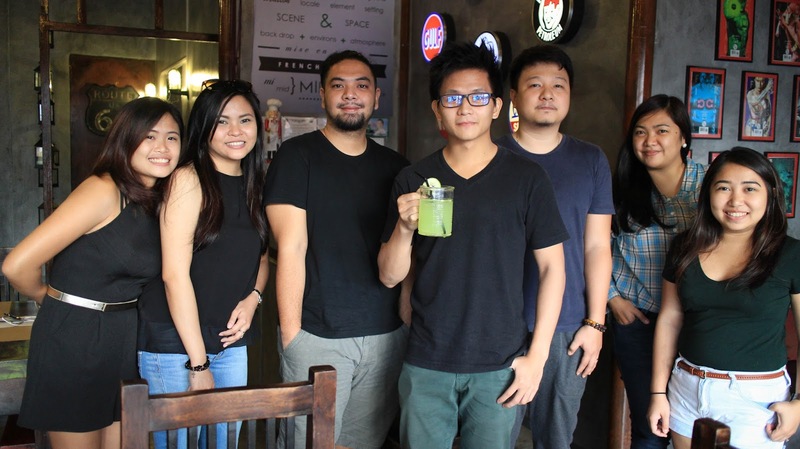 I'd definitely go back to Milieu with more friends & family because it's a new place to satisfy our cravings and a place to have a good laugh. 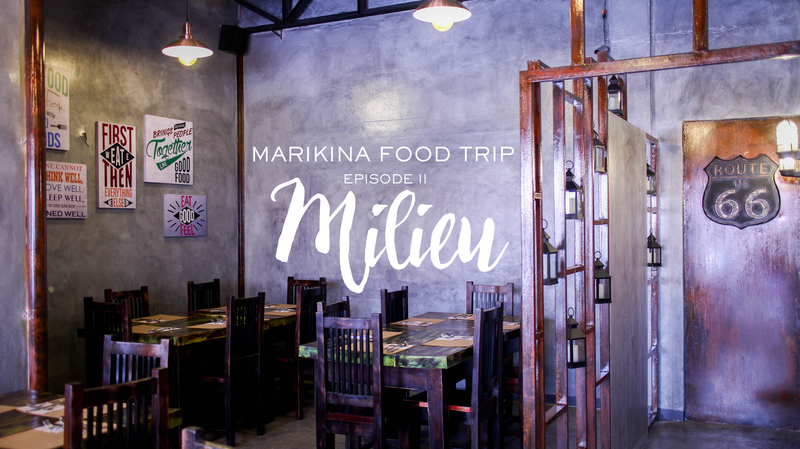 3 comments on "Marikina Food Trip Series II"
Thank you <3 Miss you too! I'll bring you here!! !